My refrigerator was overflowing with so many vegetables. When the forecast called for some rainy, cold days, I thought soup was also in the forecast. The slow cooker is always great to use during cooler weather. Cloudy cold days always make for great lazy weather--especially when those days bring rain or snow. During lazy weather, the slow cooker makes more appearances in my kitchen. Normally, I make vegetable soup on the stove, but this time, I used the slow cooker because the weather made me feel lazy. I prepared (cleaned, cut, and measured) all of the vegetables the night before, and in the morning, everything went into the slow cooker. I left the slow cooker on low all day. When I came home from work, dinner was ready! 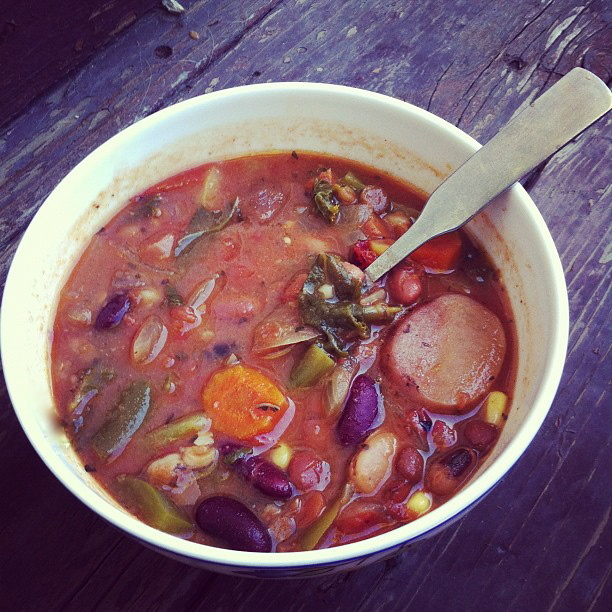 This soup will get you your daily veggie servings and more. It's jam-packed with so many different vegetables! Last time I visited a Trader Joe's, I picked up a bag of their "17 Bean and Barley Mix." I added it into the soup to increase the fiber. Since the beans were dried, I thought that cooking them in the slow cooker would be much easier because no soaking or rehydration would be needed. Wow, this was one flavorful vegetable soup! The soup is low calorie and very filling. The best part: the slow cooker does all the work! This recipe makes a large amount of soup, and I froze a good portion of it. The frozen portions made for a perfect healthy lunch and an easy way to get my daily dose of vegetables. You could easily swap out vegetables for different vegetables, too. Add all ingredients to slow cooker, and stir so that ingredients are evenly distributed. Cook on low for 8 hours, periodically stirring. * Note: The Trader Joe's "17 Bean and Barley Mix" contains dried baby lima beans, black turtle beans, blackeye peas, dark red kidney beans, garbanzo beans, great northern beans, green lentils, green split peas, large lima beans, light red kidney beans, navy beans, pink beans, pinto beans, red lentils, small red beans, small white beans, yellow split peas, and pearl barley. If you do not have a Trader Joe's in your area, you could just use a combination of the above. Since many grocery stores now have a "bulk" section, you can select a random 1 lb. assortment of dried beans and barley. The dried beans will cook just perfectly in the slow cooker, so there is no need to soak or rehydrate them. :) ". . .soup was also in the forcast." Love it! This is totally a 'go-to' for me. I love making slow cooker soups and lentils on work days because you're right...its just TOO easy!